Erenler district in Sakarya Province. Erenler is a municipality and district governorate in Greater Sakarya, Turkey. Sakarya is one of the 30 metropolitan centers in Turkey with more than one municipality within city borders. 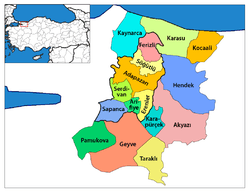 Now in Sakarya city (former Adapazarı) there are four second-level municipalities in addition to Greater Sakarya (büyükşehir) municipality. Erenler is a part of Sakarya city. It is situated slightly to the east of the urban fabric at 40°45′N 30°25′E﻿ / ﻿40.750°N 30.417°E﻿ / 40.750; 30.417. Sakarya River flows within the municipality. The average elevation of the settlement is about 32 m (105 ft) above mean sea level. During the Ottoman Empire era, Erenler was a village. Between 14 March 1921 and 21 June 1921 the village saw occupation by the Greek army. During the Republican era, the population of the village increased and consequently it became a seat of township in 1963. In 1999 Erenler suffered from the İzmit earthquake. Soon after the disaster, the town continued its growth, and it merged to the province capital. However, in 2008 it became an ilçe (district) center of Sakarya Province. As of 2014, the population of Erenler was 79,934. ↑ "Sakarya İli Nüfusu 2009" (in Turkish). Türkiye İstatistik Kurumu. Retrieved 2016-10-29. ↑ "Sakarya İli Nüfusu 2010" (in Turkish). Türkiye İstatistik Kurumu. Retrieved 2016-10-29. ↑ "Sakarya İli Nüfusu 2011" (in Turkish). Türkiye İstatistik Kurumu. Retrieved 2016-10-29. ↑ "Sakarya İli Nüfusu 2012" (in Turkish). Türkiye İstatistik Kurumu. Retrieved 2016-10-29. ↑ "Sakarya İli Nüfusu 2013" (in Turkish). Türkiye İstatistik Kurumu. Retrieved 2016-10-29. ↑ "Sakarya İli Nüfusu 2014" (in Turkish). Türkiye İstatistik Kurumu. Retrieved 2016-10-29. Wikimedia Commons has media related to Erenler.